Engine starts and stops with single, user-friendly control button. 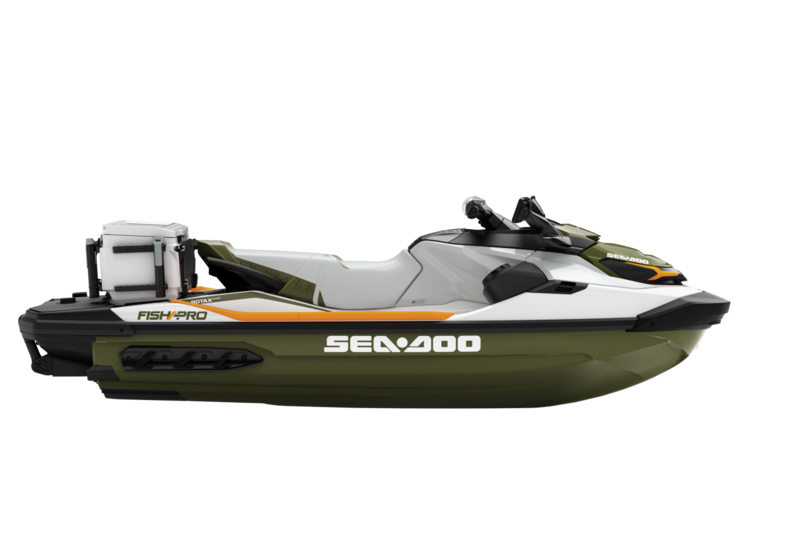 The ideal fiberglass hull for fishing is designed for rough water confidence when riding and unmatched stability at rest. GARMIN NAVIGATION AND FISH FINDER Garmin ECHOMAP Plus 62cv Fish Finder with a 6-inch (15 cm) screen and in-hull transducer. A top-of-the-line navigation, charting and fish-finding system. 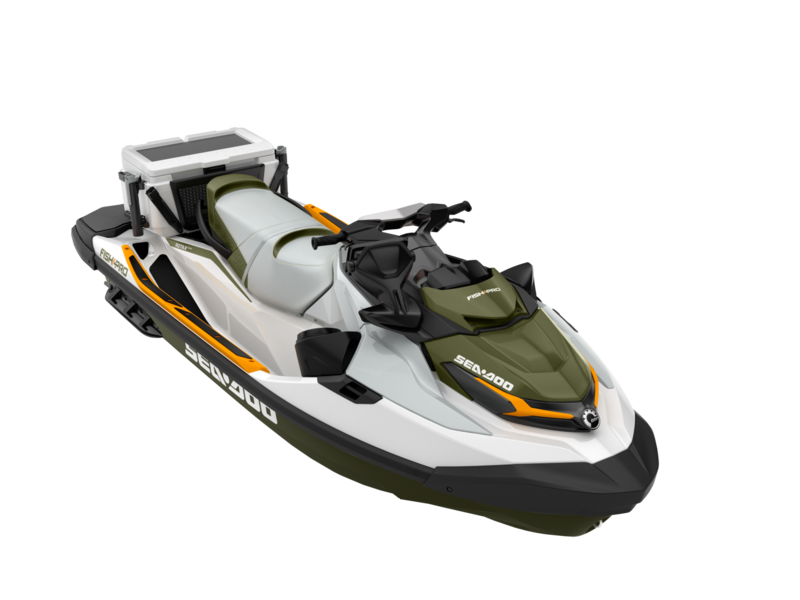 EXTENDED REAR PLATFORM Adds 11.5 inches to the back of the watercraft, more space for boarding and fishing also increases stability when fishing in rough water. LINQ FISHING COOLER A rugged 13.5 US gal. (51 L) cooler specially designed for fishing with a recessed work surface, four innovative rod holders, trolling slots, tackle and bait storage, and quick-latch system. FISHING BENCH SEAT Designed for ease of movement from driver position to passenger for fishing. Optimized for fishing facing sideways with increased lateral stability when combined with the angled footrests. ANGLED GUNWALE FOOTREST Foot supports for increased comfort and stability when fishing in rough waters. 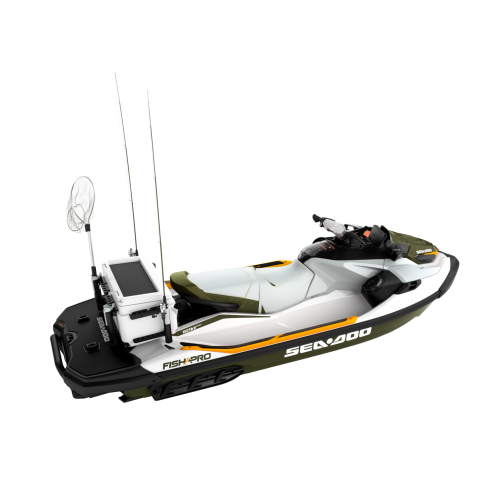 ST3 HULL The ideal hull for fishing is designed for rough water confidence when riding and unmatched stability at rest. TROLLING MODE Slow Mode speed control to make trolling easy. Set your desired speed to one of the nine pre-set positions. LINQ ATTACHMENT POINTS Two sets of attachment points for the Fishing Cooler and additional LinQ accessories, such as a small cooler to bring your lunch and a fuel caddy for your extended trip on the water. DIRECT-ACCESS FRONT STORAGE A convenient bin organizer is ideal for storing quick access items like water bottles, sunscreen or a small tackle box. WATERTIGHT PHONE BOX Shockproof smartphone storage to keep your phone connected and protected while you ride. Also, keep your phone charged with our USB port (sold as an accessory). BOARDING LADDER Boarding from the water has never been easier with the boarding ladder.